Cooking and processing food is the use of chemical technology to create a harmonious product using color, smell, taste, texture, and mouth-feel. A knowledge of basic ingredients and their chemistry will help the chef both develop new recipes and dishes and give him/her a knowledge of how to correct dishes when things go wrong. Method of cooking and its effect on foods. Boiling - Gentle boiling helps break down the tough fibrous structure of certain foods which would be less tender if cooked by other methods. When boiling meats for long periods the soluble meat extracts are dissolved in the cooking liquid. Cooking must be slow to give time for the connective tissue in tough meat to be changed into soluble gelatin, so releasing the fibers and making the meat tender. If the connective tissue gelatinizes too quickly the meat fibers fall apart and the meat will be tough and stringy. Gentle heat will ensure coagulation of the protein without hardening. 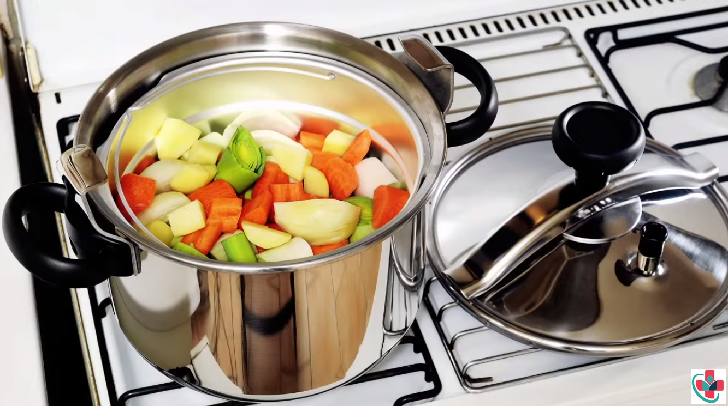 Vegetables should be boiled for the shortest time possible otherwise their nutrient content will be reduced or lost. Poaching - Helps to tenderize the fibrous structure of the food, and the raw texture of the food becomes edible by chemical action. Stewing - In the slow process of cooking in gentle heat, the connective tissue in meat and poultry is converted into a gelatinous substance so that the fibers fall apart easily and become digestible. The protein is coagulated without being toughened. Braising - Causes the breakdown of tissue fiber in the structure of certain foods, which softens the texture, thus making it tender and edible. Steaming - The structure and texture of food is changed by chemical action and become edible. Baking - Chemical action caused by the effect of heat on certain ingredients (e.g. yeast, baking powder) changes the raw structure of many foods (e.g. pastry, bread) to an edible texture. Roasting and spit-roasting - The surface protein of the food is seared by the initial heat of the oven and improves the appearance, but not necessarily the palatability. This does not necessarily prevent the escape of the natural juices as was once thoughts to happen. When the food is highly browned, the oven temperature is reduced to cook the inside of the food without hardening the surface. Grilling - Because of the speed of cooking, there is maximum retention of nutrients and flavor because the effect of fierce heat on the surface of meat rapidly coagulation and seals the surface protein, thus helping to retain the meat juices. Shallow-frying - The high temperature produces almost instant coagulation of the surface protein of the food. Some of the frying medium will be absorbed by the food being fried, which will change the nutritional content. Deep-frying - Foods coated with flour, eggs, milk, breadcrumbs or a batter absorb the minimum amount of fat because the surface is sealed by the coagulation of the protein, Uncoated foods, such as chips, absorb a huge amount of fat, thus affecting their texture and nutritional content. Paper bag cookery - Because the food is tightly sealed in oiled greaseproof paper or foil, no steam escapes during cooking and maximum natural flavor and nutritive value are retained. Microwave cookery - A method of cooking and heating food by using high-frequency power. The microwave disturbs the molecules or particles of food and agitates them, thus causing friction, which has the effect of cooking the whole of the food. This method of cooking causes the food to become edible by the heat generated. Proteins become denatured, starches are gelatinized, with most of the moisture and flavor being retained.